In 1892, a deposition was taken in a Salt Lake City courtroom to gather evidence in a land ownership battle between two offshoot branches of the Church of Jesus Christ of Latter-day Saints (LDS) The dispute centered on ownership of land purchased to build a temple, known as the Temple Lot property, in Independence, Missouri. 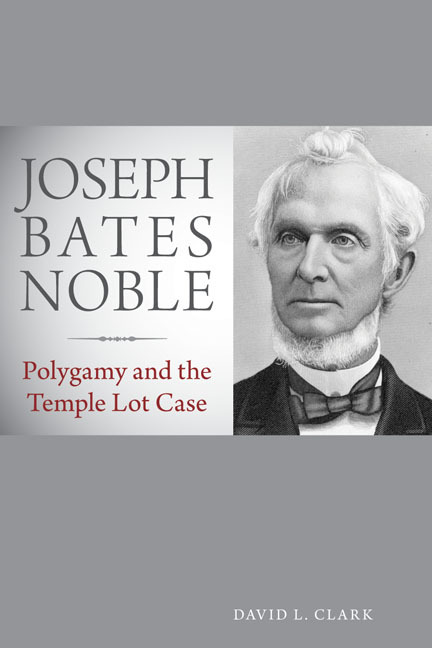 Although a key witness at the deposition, Joseph Bates Noble had little knowledge of land purchases dating back to 1832, yet his testimony was critical for validation of standing for the Reorganized Church of Jesus Christ of Latter-Day Saints (RLDS) or for the Church of Christ (Temple Lot). In fact, at the age of 82, Noble had been thrust into the limelight of LDS Church history because of his claim to have presided over the first polygamous marriage of Mormon prophet Joseph Smith. Noble officiated at the marriage in 1841 that united his sister-in-law with Smith, an event now cited as the beginning of the practice of polygamy in the church. His testimony would either validate Joseph Smith’s polygamist background for the Temple Lot Church or expose his recollections as falsehoods for the RLDS Church. David L. Clark is W. H. Twenhofel Professor Emeritus at the University of Wisconsin, Madison. He also taught at Southern Methodist University and Brigham Young University. His work has been published in The Journal of Mormon History and Brigham Young University Studies.